This proposal considers the transportation infrastructure as a flexible element aimed at performing a wide range of resilient functions. The Raising of Morrissey Blv at 18 ft NAVD88 and its connections to the adjacent neighborhoods represent an opportunity to redevelop the whole Columbia Point through an overall strategy based on habitat restoration and sustainable urban landscaping. An urban wetland is planned aside Morrissey blvd to create a rain garden belt connected with the Patten’s Cove Salt Marshes which are restored to their original functionality (8). A floating waterfront is set along the newly created canal whose green sea walls allow a direct relation with water (3). 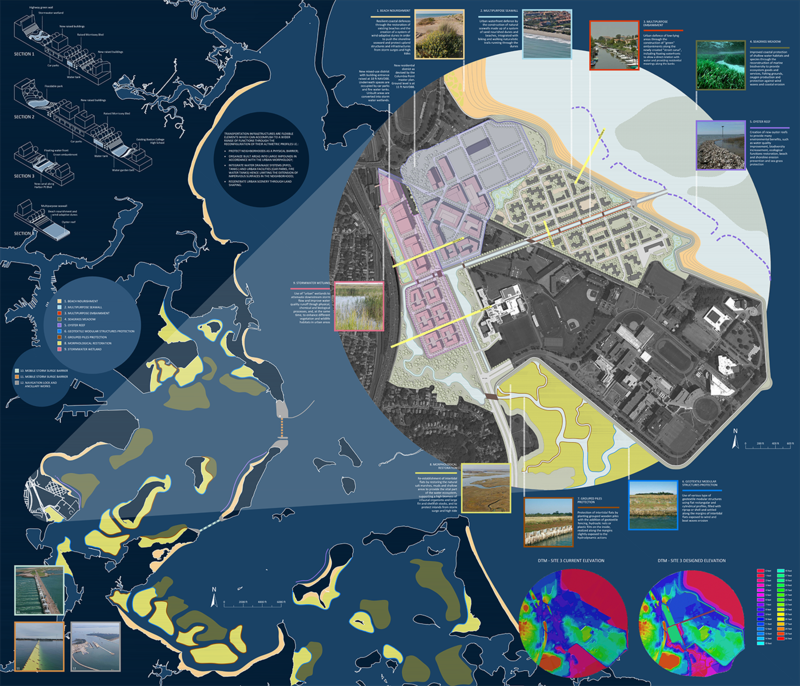 The new Columbia Point urban development is designed according to the concept of a total resilient eco-city in which a comprehensive watersheet activation plan plays a central role. Reorganize and integrate water drainage systems and urban facilities underneath the newly raised areas. Bioremediation wetlands using Halophytes to improve water quality (9). Such measures fully comply with the worst case scenario of sea level rise presented in the call. Nevertheless, according to up-to-date European approaches, higher levels of resilience and adaptability could be obtained associating, in a larger bay scale, the proposed measures to a system of mobile storm surge barriers (10-11) enabling the territory to face future possible more critical sea level rise scenarios and extraordinary events (hurricanes, tsunamis..). Better and safer management of the harbor activity (12).